Fast QImage to/from QPixmap conversion. KPixmapIO implements a fast path for QPixmap to/from QImage conversions. It uses the MIT-SHM shared memory extension for this. If this extension is not available, it will fall back to standard Qt methods. You can use KPixmapIO for load/saving pixmaps. It also has functionality for partially updating/saving pixmaps, see putImage and getImage. Speed measurements were taken. These show that usage of KPixmapIO for images up to a certain threshold size, offers no speed advantage over the Qt routines. Below you can see a plot of these measurements. The threshold size, amongst other causes, is determined by the shared memory allocation policy. If the policy is ShmDontKeep, the shared memory segment is discarded right after usage, and thus needs to be allocated before each transfer. This introduces a a setup penalty not present when the policy is ShmKeepAndGrow. In this case the shared memory segment is kept and resized when necessary, until the KPixmapIO object is destroyed. The default policy is ShmDontKeep. This policy makes sense when loading pixmaps once. The corresponding threshold is taken at 5.000 pixels as suggested by experiments. Below this threshold, KPixmapIO will not use shared memory and fall back on the Qt routines. When the policy is ShmKeepAndGrow, the threshold is taken at 2.000 pixels. Using this policy, you might want to use preAllocShm to pre-allocate a certain amount of shared memory, in order to avoid resizes. This allocation policy makes sense in a multimedia type application where you are constantly updating the screen. 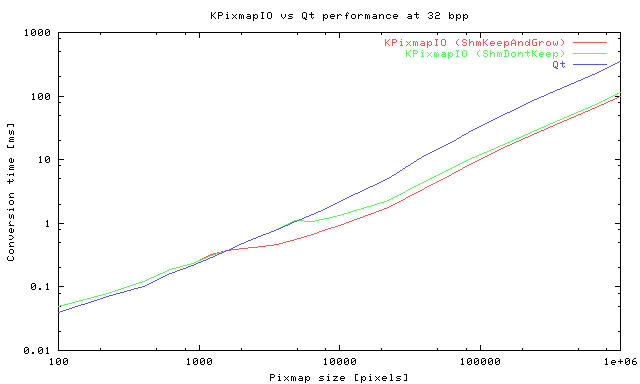 Above a couple times the threshold size, KPixmapIO's and Qt's speed become linear in the number of pixels, KPixmapIO being at least 2, and mostly around 4 times faster than Qt, depending on the screen and image depth. Speed difference seems to be the most at 16 bpp, followed by 32 and 24 bpp respectively. This can be explained by the relatively poor implementation of 16 bit RGB packing in Qt, while at 32 bpp we need to transfer more data, and thus gain more, than at 24 bpp. For large pixmaps, there's a definite speed improvement when using KPixmapIO. On the other hand, there's no speed improvement for small pixmaps. When you know you're only transferring small pixmaps, there's no point in using it. Definition at line 87 of file kpixmapio.h. Definition at line 142 of file kpixmapio.h. Definition at line 83 of file kpixmapio.cpp. Definition at line 176 of file kpixmapio.cpp. Convert a pixmap to an image. pixmap The pixmap to convert. Definition at line 205 of file kpixmapio.cpp. Convert an image to a pixmap. The pixmap containing the image. Definition at line 187 of file kpixmapio.cpp. This function is identical to the one above. It only differs in the arguments it accepts. Definition at line 252 of file kpixmapio.cpp. Transfer (a part of) a pixmap to an image. Definition at line 258 of file kpixmapio.cpp. KPixmapIO will be able to transfer images up to this size without resizing. size The size of the image in pixels. Definition at line 897 of file kpixmapio.cpp. Definition at line 217 of file kpixmapio.cpp. Bitblt an image onto a pixmap. src The image to load. Definition at line 224 of file kpixmapio.cpp. Set the shared memory allocation policy. See the introduction for KPixmapIO for a discussion. Definition at line 898 of file kpixmapio.cpp.